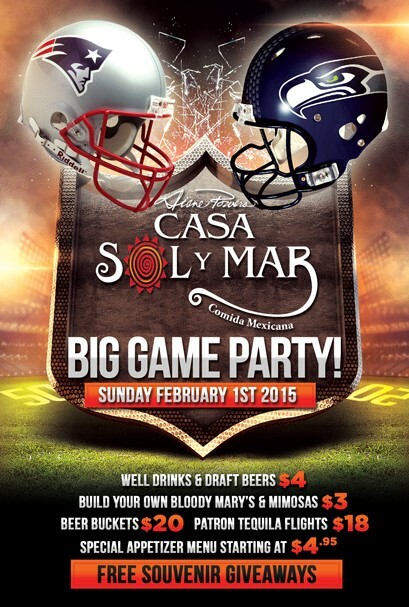 Celebrate the big game Casa Sol y Mar style – even from home! Let us cater your Super Bowl party with a variety of our to-go party platters including guacamole, chips and salsa, taquitos, quesadillas and more. Let us do the work in the kitchen so you can enjoy the game! Call 858-792-4100 to order. 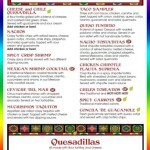 Have a Super Bowl Fiesta at Casa Sol y Mar! 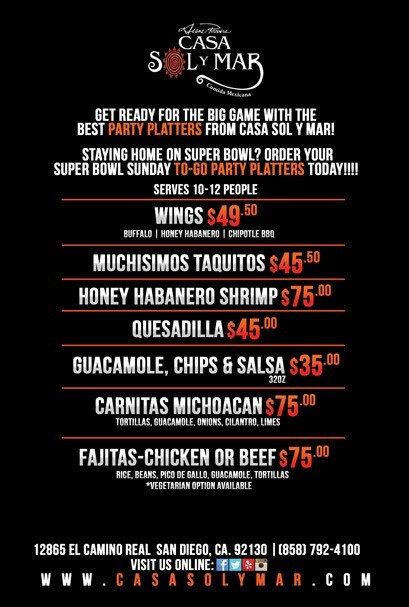 Casa Sol y Mar is the best place in Del Mar and Carmel Valley to watch the Super Bowl! Our Super Bowl Fiesta will include free souvenir giveaways, $4 well drinks and draft beers, $3 build-you-own Bloody Marys and Mimosas, $20 beer buckets, $18 Patron Tequila Flights and a special appetizer menu starting at $4.95. Our NEW $3 build-your-own Bloody Mary bar allows guests to customize their cocktail with a line-up of optional garnishes including: a variety of citrus, pickled green beans, olives, banana peppers, pepperoncini, steak sauce, horseradish, cholula sauce, chipotle sauce, green tabasco sauce, Tapatio Hot Sauce, bacon, blue cheese, pepperoni and pickled asparagus. Rim toppers include Old Bay Seasoning, sea salt, celery salt, garlic salt, tajin and chili. “Cheers” your friends and enjoy delicious bites while you watch the game in one of San Diego’s most festive restaurants. You can RSVP on our Facebook event page. 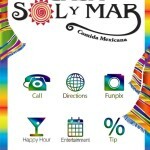 Download Casa Sol y Mar’s Mobile App! Have you downloaded the Casa Sol y Mar restaurant app? You can quickly give us a call, calculate your tip, view our Happy Hour specials AND take great photos marked with our logo! This app conveniently places our menu, specials and entertainment schedules in the palm of your hands. Any information you might need to plan your Casa Sol y Mar Mexican dining experience can now be on the home screen of your smart phone. Pick a date, grab a friend and document your experience with our Casa Sol y Mar Funpix! Don’t forget to share your photos with us by tagging #CasaSolyMar. Here to help aid with post-New Year’s Eve recovery, we’re debuting a build-your-own Bloody Mary bar in the Cantina, starting New Year’s Day and then every Sunday in January from 11 a.m. to 3 p.m.
Diners are invited to relax, enjoy watching a football game on one of the TVs, and concoct their own personalized Bloody Mary. 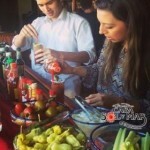 An optional line-up of garnishes include: a variety of citrus, pickled green beans, olives, banana peppers, pepperoncini, steak sauce, horseradish, cholula sauce, chipotle sauce, green tabasco sauce, Tapatio Hot Sauce, bacon, blue cheese, pepperoni and pickled asparagus. Rim toppers include Old Bay Seasoning, sea salt, celery salt, garlic salt, tajin and chili. 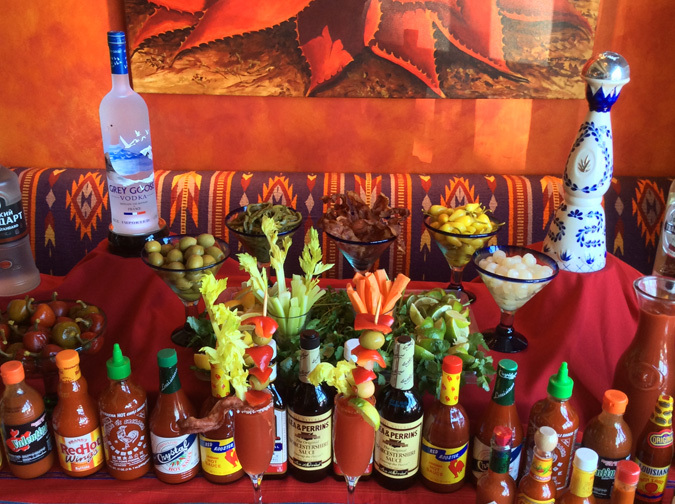 Each Bloody Mary is $3 and comes with Vodka, Tequila, Mary Mix, V-8 and Clamato. Guests can also opt for a fresh Mimosa for $3 – traditional or organic pomegranate-cranberry flavors available.